Kathak: This dance form originated from northern part of India. . This is also dance drama concept. It is one of the most important classical dances of India. The word Khatak is derived from the Sanskrit word Khatha which means story and Kathakars mean story tellers. These Kathakars moved from one place to another by reciting story through dance song and music. The kathakars usually illustrated the story of Lord Krishna through hand and foot movements along with facial expressions. 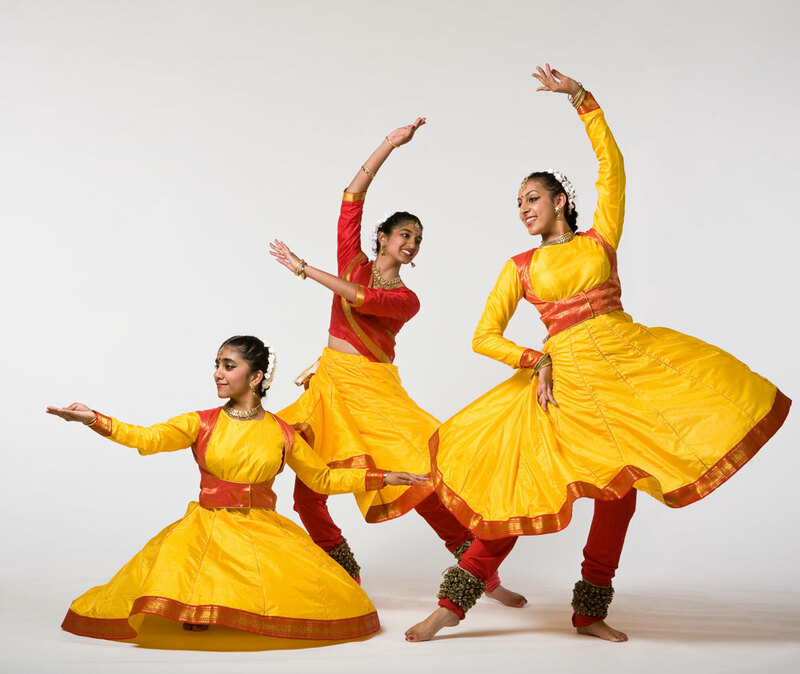 Kathak dance form evolved during the bhakti movement. A very old dance form, according to Mary Snodgrass this form evolved as early as 400BC. Like other dance forms even kathak has its roots from the ancient text Natya Shastra written by Bharata Muni. Kathak involves the story of lord Krishna and other mythological stories involving lord Krishna. Kathak is practised by three different schools namely Jaipur, Benaras and Lucknow. The main difference between these schools is acting and footwork. The Lucknow school gives importance on acting and Jaipur gives importance on footwork. Among all the three gharanas Benaras is the oldest gharana. The dance begins with a prayer to God, to the Guru and to all the musicians on the stage. However the present day form of Kathak includes invocation a pure dance recital and another expressive recital form in all three gharanas. it includes both the form Nritta and Nritya. Nritta is the pure form of dance and Nritya is the expressive form of dance. Nritta begins with slow and steady movement of eyebrows, hands and neck. The speed gradually increases before the completion of one bol. As soon as one section is completed the dancers usually take a sharp turn of the head. In Nritta the foot movements are called as tatkars. However in Nritya emphasis is given to communicate the feelings through dance form. Its main aim is to engage the viewers mentally and emotionally. 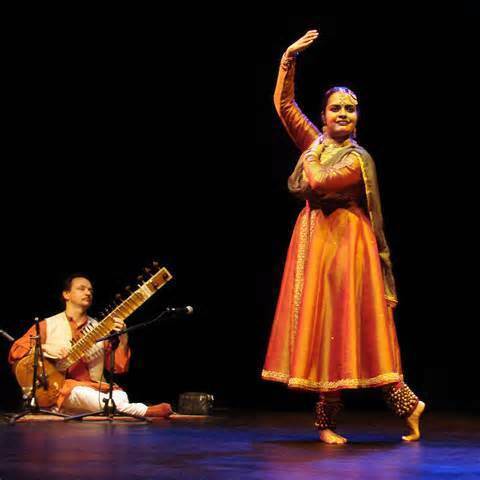 The most common instruments used in kathak are tabla, sarangi and manjira. The dance can be a solo dance or a group dance. To engage the audience one or more artists may come to them and interact with the audience. Also the speed and the energy of the dance increases to keep the tempo of the audience. Kathak involves lot of upper body movement and hand movements. The foot work is very important. The dancers wear ghungroo in this dance form also. Eyes show the expressions and acts as a medium of communication of what is being recited in the story. There are lot of bends and turns in Khatak. This dance was performed in the royal courts during Mughal period. Slow improvisation by the dancers during Mughal period was made to entertain the royal courts and the audience through sensual and sexual performances. This dance is common both in Hindus and Muslims. The female dancers wear both saree and blouse to cover the upper part of the body or long full length skirt with tight chudi pyjamas. The skirt has lot of flares with different colour contrast. A scarf is tied from the upper body till waist. Lot of jewellery is worn along with lot of makeup. Jewellery is worn on neck, wrist, ear and on face. The male dancers usually wear a dhoti and tight chudi pyjamas with a scarf that covers their upper body. The Hindu female dancers may wear Sari and a blouse or a long embroidered skirt with a blouse along with a scarf on the head. The Muslim female dancers wear a long Long skirt with tight pyjamas and a long coat covering the hands and the upper part of the body. The Kathak dancers use many instruments. Some of the common instruments used are table, sarangi, manjira and harmonium. Some of the famous dancers of this form include Shambhu Maharaj and his brothers Lachhu Maharaj and Acchan Maharaj all belong to Lucknow school. Some other artist includes Kumudini Lakia, Roshan Kumari and many more.